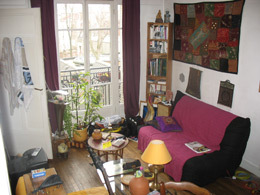 The flat in Paris :33m² located half way between Montmartre and Saint Denis Cathedral. 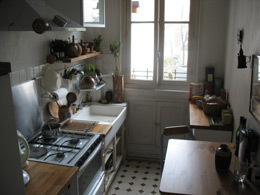 it's nicely organized : Entrance with two large cupboards, a lounge with a double sofa-bed and a mezzanine double bed, a kitchen and bathroom with all appliances but drier, a small table allows 3 people for dinner. Every room overlooks a quiet backyard with evergreen plants, sunny in the morning and midday. It has Internet Wi-Fi. It's on the third floor with lift. It's quite convenient for two people, but we are three when we visit our son. Offered for rent since january 2017.